Second only to our hands, good kitchen knives are the single most important tool a cook has in her toolbox. With only a few different styles, she can do just about everything she needs to do this side of the cutting board. Before you head out and spend a small fortune, or worse, get the cheapest set available, there are a few things you should know. 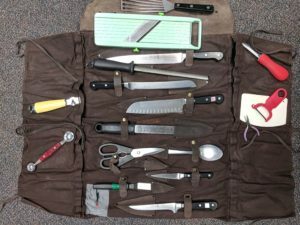 There are over 10 different parts to a chef’s knife. But there are 4 that are most important when shopping for the right knife for you: Point, Edge, Tang and Handle. Point: The very tip of the cutting surface where the edge meets the spine. It can be curved up, down and everything in between. Some specialty knives may have a curved or bent point, like a cheese knife. But for most basic chef’s knives, (that’s the big one that comes in a set), a gentle curve that follows the edge of the blade is best. 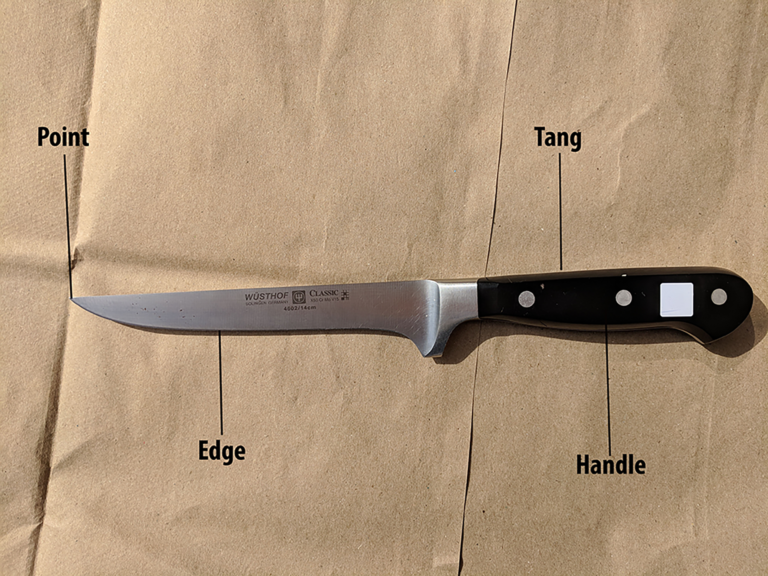 Edge: This is the cutting side of the knife. It’s the part that does all the work, so this is an important part! In the kitchen, there are three basic styles: hollow-grind, flat-grind and serrated. A hollow-ground edge is a finer edge that is best for slicing and cutting. It tends to be more delicate and may need to be sharpened more often. Chef’s knives, boning, paring and utility knives tend to have this type of edge. Flat-ground edges are best for knives that are going to do a lot of chopping thru harder objects, like bones- think meat cleavers. Serrated knives have a single-sided scalloped edge. This type of edge is great for slicing thru crumbly foods like breads and cakes, and sometimes tomatoes. Sharpening a serrated edge can be tricky though. Tang: The tang is the extension of metal that runs from the base of the blade thru the handle. The farther back the tang runs thru the handle, the sturdier the knife and the more stable the blade will be. Cheaper knives tend to have partial tangs. 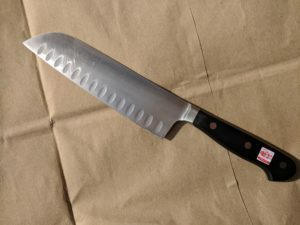 This feature can be used to easily determine the quality, and often price, of a good kitchen knife. Handle: The handle of a knife can be made out of just about anything, from rope to bone to wood to plastic. It can be decorative, or purely functional. Most are made from a polymer-type material and hold up well to extensive use. Some have finger grooves for grip, others do not. It is important to “try on” a knife before buying, hold in your hand and see how it feels. Your chef’s knife should be an extension of your hand, so you want to make sure it feels good. Kitchen knives are made from several different metals, or a combination. The two most common are carbon- steel or stainless-steel. The higher the carbon content, the less strong the knife, but the sharper the edge can get. Also, they tend to be more expensive. Stainless steel knives are great because they resist against rust and are super strong. The edge on stainless is harder to keep, in that it probably needs to be sharpened more often. But it’s still a great material for kitchen knives. The most common type of steel for kitchen knives is stainless steel. Do you get a whole set, or do you just buy one or two? Well… that’s up to you. Most commercial knife sets offer quite a variety. And they usually come with a “set” of steak knives. But you don’t always get the best bang for your buck, so maybe you want to just buy them individually. Each knife has a specific purpose. But most can be used for more than one job. 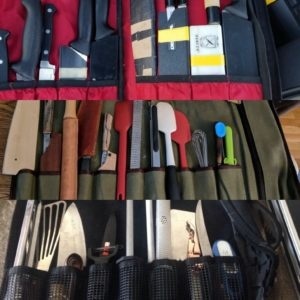 Do you really need two different sized chef’s knives, two utility knives, etc? On a regular basis, you will probably only use 3-4 different knives. There are a couple of knives that are great to have, but you won’t use all the time. And there are a few extra things that are nice to have around. The following are my suggestions. Chef’s knife (the big kahuna) can be used for just about everything. Wide, long blade. Typically, 10-12 inches long. Can be traditional or “Santoku” style. Boning knives are, well…it’s in the name! They are used to remove bones from whole animals and are great for removing skin from fish filets. Thin, narrow, flexible blade. Typically, 8-10 inches long. Paring knives are best for smaller, more delicate work. Shaped like a chef’s knife, they are usually only 3-4 inches long. Utility knives are shaped much like a chef’s knife but usually shorter and narrower. They are another great work horse on the cutting board. I use mine when I need to cut something and I feel like the chef’s knife is overkill, but the paring knife won’t quite cut it. Like an apple. Bread knives are serrated and essential in the kitchen. You may not use it every single day. But when you need it, you NEED it! You want one that has a long blade on it, at least 12 inches. It’s gotta go all the way thru the loaf of bread, so you don’t want a short blade. Kitchen Shears, or scissors as most people call them, are also great to have around. 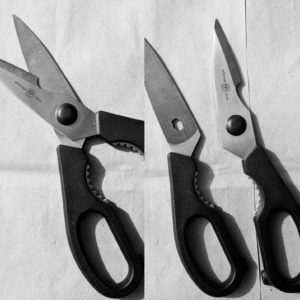 Don’t use the same scissors the kids use for crafts. Glitter is not a good garnish. You want a dedicated set in the kitchen. They should easily come apart for thorough clean-up. And you will want to have them sharpened at the same time as your other blades. Honing Steel, a vital tool in every kitchen, should not be overlooked. Most knife sets come with a stainless rod attached to a handle made of the same material as the knives. But there are lots of different honing steels on the market now. Mine is a diamond-coated steel shaft made by Wusthof. Proper honing technique is just as important as the steel itself. So, learn how to do it properly and your knives will last a lot longer. Where do you keep your knives? In a block on the counter? On a magnet on the wall? Or…GASP!…in a drawer (at least keep the blades protected with a sheath!)? Where you store them is up to you, and there are pos and cons to each way. But until we invent a way for them to magically float in space, we have to keep them somewhere. The most important factors for you will be space and safety. So store them in a way that works for you and forget the haters. Unfortunately, just like everything else, price matters. But you can still get good, quality kitchen knives at just about every price point. So buy the best you can afford, take great care of them (dishwasher is a big NO-NO! ), sharpen the blades regularly and they will last you a long time.